Wildlife and jungle safari tour in Nepal offers wonderful nature and unique wildlife adventure experience for Nature lovers, bird watchers, wilderness spectators. Jungle safari tour in Nepal suite for those trekkers/travelers/adventure seekers after Nepal trekking , Nepal tours or other adventure tour in Nepal but we offer Nepal Jungle safari tours with originally as per visitors interest and holiday schedule. Jungle safari tour in Nepal offers you the chance to enter the jungle and view some of the rarest and most endangered wildlife on earth. Jungle Safari in Nepal can be a very amazing experience fit for all age groups trekkers and travelers. March, April , September, October, November and December are best month for Jungle safari tour in Nepal. Nepal has several national parks for wildlife safari tour among them Chitwan jungle safari tour, Bardia Jungle safari tour , Koshi Tappu wildlife safari tour are most popular wildlife adventure destination in Nepal. Jungle safari tour in Nepal can be 2 days to 7 days as per travelers choice and holiday time frame. Wildlife tour in Nepal is ideal for family, schools and academic students, club groups and incentives groups because in limit time frame get maximum enjoyments. Wilderness Excursion operates several safari tour beside Nepal trekking. The safaris are arranged to Chitwan National park, Bardia National park and Koshi Tappu wildlife conservation area. 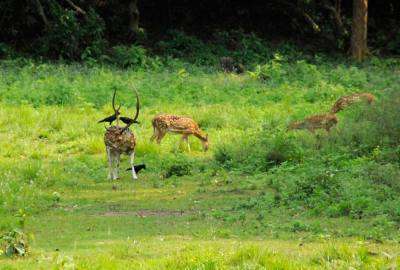 All most Nepal Jungle safari tour lies in southern lowlands of Nepal are known as the Terai. This area is covered in dense tropical jungles and is home to thousands of bird and animal species, including some of the world's most exotic and endangered species. Due to increases in population, deforestation, and illegal poaching, the natural habitats of animals like One-Horned Rhino, Royal Bengal Tiger, Snow Leopard, Red Panda, Blue Bull, and the Gharial Crocodile are being destroyed, and leading these creatures to extinction. This loss of Wildlife must be stopped so that future generations will have a healthy and balanced way of life. Fortunately, efforts are being made by the Nepalese government to preserve these natural wildlife sanctuaries and to maintain balance in the local Eco-systems. A number of conservation areas, national parks, wildlife reserves, and hunting reserves have been established in Nepal. Nepal Jungle safari tour take to you heart of the Nepal forest with wild life safari tour less then one week holidays in Nepal.